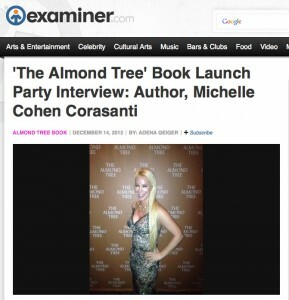 Examiner.com recently published an interview with The Almond Tree author, Michelle Cohen Corasanti. You can read the full interview below or click the image to download a PDF copy. After meeting you briefly in person at the book signing, you mentioned it took several years for ‘The Almond Tree’ to come to fruition, please explain the process you went through. I was raised in a Zionist home where Israeli bonds were plentiful and German cars boycotted. I graduated from a yeshiva and then went to Israel to study Hebrew and Judaism with our rabbi’s daughter in high school. I didn’t go over there with intentions to become a human rights activist, but I became like the witness who saw too much. When I returned in 1989, I wanted to devote my life to helping bring about a just peace. After finishing my MA in Middle Eastern studies, I transferred into the Ph.D. program at Harvard and also enrolled in law school. I should have read Scott Turrow’s One L. In addition, I was in a relationship with a Palestinian from Israel I met at Harvard. He was doing his post doctorate in chemical physics jointly with a Nobel Prize winner and his Israeli professor and mentor. He mentioned, only in passing, that his father had gone to prison for 14 years. This man was twelve years old at the time. With an illiterate mother and eight younger siblings, he was forced to work to support his family. Thanks to his genius in math and science, he was able to attend school infrequently and still win a scholarship to the Hebrew University. There, the Israelis recognized his genius and embraced him. My workload was crushing. My partner wanted to be a professor. When he returned from giving a lecture at MIT, he mentioned that a professor there said it didn’t matter that he was brilliant. If he couldn’t speak English, he couldn’t get a job. Since I only spoke to him in Arabic and occasionally Hebrew, when we were with Israelis, I hadn’t noticed his lack of English skills. Also I didn’t realize that finding an academic position was harder than solving peace in the Middle East. Now I was forced to translate his lectures for him in addition to my work. For my last semester in law school I went home to work for my father’s law firm, met my husband, had children and buried my dreams. Basically, I turned out to be the absolute worst human rights activist ever having jumped ship before I even began and crushing a man who I felt sorry for because of what he had been through. Fast-forward almost two decades and I was vacationing with my family when I read in The Kite Runner how one’s past has a way of clawing its way out. For whatever reason, everything I buried could no longer be suppressed. But The Kite Runner went on to say that history, politics and religion cannot be overcome. That’s when I got the idea for my book because I had seen with my own eyes how these obstacles could be overcome. I said to myself, if a doctor can write The Kite Runner than surely I, a lawyer, trained in writing, could write a novel. Seven years, twenty-one writing classes, six editors, years of reading the classics (to see why certain books endured the test of time) and best-sellers (to see what people saw in them) as well as books like Uncle Tom’s Cabin that brought about social change, my book was ready. Garnet publishing in the UK bought the world rights and it was just released in the US October 16, 2012. I would like them to realize that we can focus on our difference and destroy each other or embrace them, make our worlds big and advance humanity. The Nazis convinced their followers that the Jews were lesser beings that evilness was in our blood. We are all humans entitled to equal rights. In the US, we are feed a very one sided version of the events. The lessons I took away from the Holocaust were not that Jewish values are dead, but that we can never be bystanders to human suffering. I don’t believe that Jewish suffering during the Holocaust gives us the right to cause Palestinians to suffer. If one supports the idea that we need a Jewish only country or as close to religiously pure county as possible on all of historic Palestine and to achieve that goal we will do whatever it takes to the natives, one must accept ethnic cleansing and/or apartheid, house demolitions, land theft, racism, imprisonment of wives, mothers, children, fathers without being charged with a crime, murder and the list goes on. For me, peace is more important than a Jewish only country on all of historic Palestine. I believe that peace brings security and not the other way around. That peace is obtainable, but only if there is justice. No one is free until we’re all free. We have to let go of hatred and extend our hands in peace and work together to make everyone as strong as they can be. I noticed a lot of famous faces at your launch party. How did you meet each of them and do you have any favorite celebrities? If so, which ones and why? We met Gilbert Gottfried, Jill Zarin, and Kelli Bensimon through friends of friends. Jamie Biden and John Cenatiempo through my husband’s college roommate and long-time friend film producer Brad Zipper. My husband knows Guillermo Fesser from their time together in LA and Spain. The Israeli singer David Broza and the Israeli fashion designer Nili Lotan came to the party with Guiellermo Fesser and his wife Sarah. I love Robert De Niro. He’s a brilliant actor and he understands the Palestinian plight. Do you foresee peace in the near future in the Middle East? What is needed now and why? (e.g. The Iranian threat). Furthermore, Israel creates pretend fear and threats against the Jews in order to justify its treatment of the Palestinians. The US gives Israel, a wealthy country, over $8.2 million a day in aid and complete diplomatic backing. Israel has been illegally colonizing Palestinian lands and making life so miserable for them that anyone who wants any kind of life for their children will leave. Zionism couldn’t be further from Judaism. When we recognize what Zionism did to the Palestinians they are compensated and we allow them to live with equality, freedom, human dignity and everything else we so cherish, peace will be possible. The Israeli government wants its citizens and the US to believe that there is no hope for peace because the Palestinians don’t want peace. Instead of peace, all the Palestinians want to do is wipe the Jewish state off the map. A quick look at a map shows who is wiping whom off the map. If there is no hope, the US won’t pressure Israel to make peace with the Palestinians. The Israeli government is interested in maintaining the status quo. Our greatest hope is for the people of the US to understand the situation and change US policy. Any last thoughts or comments you’d like to add? We need to acknowledge that to have a Jewish state on Arab lands where there are two peoples living under the same government roughly equal in numbers, the only way to maintain that is through apartheid and/or ethnic cleansing. If you believe the Palestinians should not live on Palestinian land simply because they are not Jewish, then you need to understand that you are supporting racism, ethnic cleansing and/or apartheid and all the policies that are used to implement the later: house demolitions, administrative detentions, ghettoizing people, depriving them of food, shelter, and water, killing, stealing, imprisoning men women and children or anyone who resists or the oppressor desires etc… The decision for Jews is if you chose Judaism or Zionism because they are difference religions. There will never be peace until there is justice. Corsanti’s Book, please call 315.768.1075 availabe through Amazon.com and Barnes and Noble.